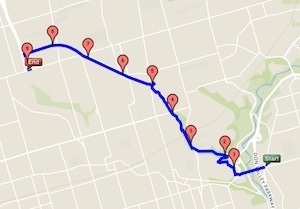 Short urban walk from Broadview TTC to Eglinton West TTC. and then take the Beltine to Eglinton West TTC. Check out a route map here. We'll move at a steady pace of ~4.5 km/hr. We will have 1-2 short water/snack/bathroom breaks as needed. Event Directions: Meet at Broadview TTC station. There is Green P parking at 35 Erindale Avenue (right behind the TTC station).